Lift & Co Moves into their New Offices! Lift & Co has moved into their new office spaces in a historical post-and-beam building in Toronto’s Financial district. We are very excited to share some new photos of their dynamic and colourful space taken by DoubleSpace Photography. Sidewalk Labs has been featured in Azure Magazine as an innovative tech-office for the next generation! "There are so many interesting experiments, collaborations and happenings taking place inside 307, Sidewalk Labs’ Toronto HQ, that you might not notice the design. Which is possibly what makes this a perfect hub for the Google/Alphabet entity’s waterfront development. Working inside the good bones of an existing former fish processing plant in the Portlands, Toronto architecture firm Lebel & Bouliane “peeled back the decades of modern renovations” to the 1,400-square-metre space and then implemented a number of interventions. A dramatic geometric entrance desk welcomes visitors in. It’s clad in plywood – the predominant material that was also used for the ceiling slats above – and shaped like a ship’s hull. Through an alcove – currently animated by a dappled-light canopy by Parasoleil – you come upon a glazed boardroom and the double-height prototyping space. The firm calls it the XXL Workshop Space and it is where all the real action takes place." From Canadian Architect: "Lebel & Bouliane has re-interpreted the interior of a forgotten fish processing plant in Toronto’s Portlands into the new headquarters of Sidewalk Labs in Toronto. The new HQ, dubbed “307,” will act as a testing grounds for new Sidewalk Labs initiatives and an office space for their Toronto team. The project benefits from the intentions of the original processing plant, which was designed to optimize light and spatial efficiency. A large south-facing clerestory window, tall ceilings and a remarkably open floor plan are ideal for Sidewalk Labs’ need for flexible experimentation and exploration space. Before adding new geometry, Lebel & Bouliane carefully peeled back the decades of modern renovations to reveal and express the original character of the fish processing plant. With the original industrial structure exposed, the architects set out to purposefully and conscientiously weave a series of humble, modern forms into the character of the existing building." 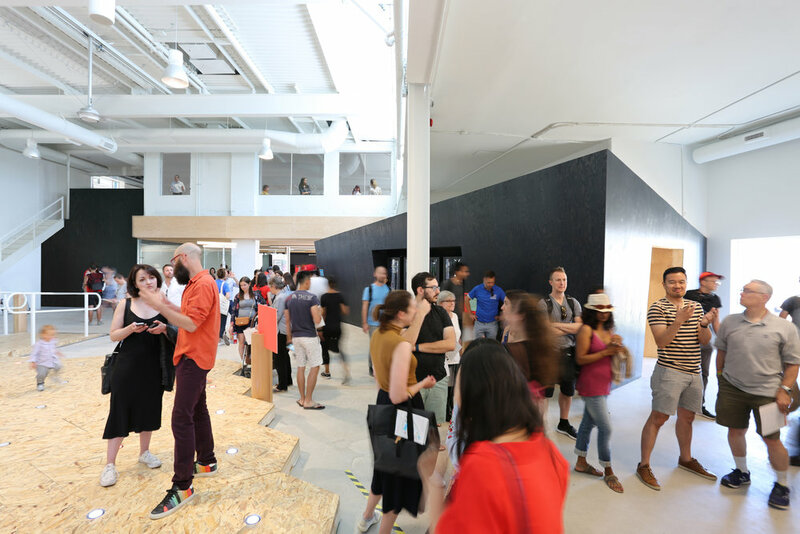 Blog TO: Sidewalk Labs just Opened its Doors to Toronto's Neighbourhood of the Future. From Blog TO: "Once a fish processing plant, the sprawling headquarters benefit from plenty of natural light and high ceilings — exactly what you'd expect a Google-affiliated space to look like. Employees of Sidewalk Labs will have their offices on the second floor of the building, while the first floor reserves some space for meeting areas and a reception. The main attraction of 307, however, is its interactive space, where all the demonstrations will take place. The real goal of the space is prototyping: new inventions and ideas for Quayside will eventually be tested out at 307 to gauge reactions from the public. A 'feedback wall' full of sticky notes will let the Sidewalk Labs team know how users felt about the experience. " Azure Magazine has written an article about all the innovative things to explore at 307, Sidewalk Labs' New Toronto HQ, Designed by Lebel & Bouliane. "Dynamic streets, outdoor comfort zones, tall timber buildings, digital electricity and more. We stepped inside Sidewalk Labs’ 307, a newly opened prototyping space, to find out what the future of Toronto’s most anticipated (and not quite green-lit) development might look like. Since the announcement late last year that Sidewalk Labs would develop a proposal for a chunk of Toronto’s Port Lands, the Alphabet/Google entity has hosted many roundtables, panel discussions and info sessions. This community engagement has been a proactive way of showing the city and its residents how transparent its smart-city enterprise is and will be – and of assuaging concerns about how data will be collected and personal privacy protected – and emphasizing the importance of community feedback and collaboration. But concrete details were scarce about the still-tentative project (Sidewalk Labs has been invited by Waterfront Toronto to present a plan but the city will still need to green light it) and many have struggled to visualize what Toronto’s smart city on a 12-acre L-shaped chunk of waterfront property would look like. That changed this past weekend when Sidewalk Labs opened 307, its Lakeshore Blvd. E. hub, and shared with the public the tangible ideas it’s exploring in partnership with numerous architecture, planning, and technology firms. 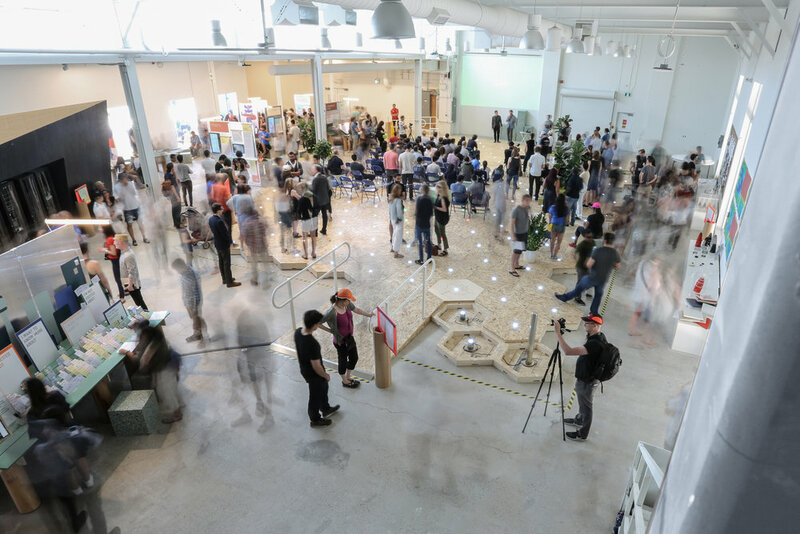 Over 1,000 locals dropped in to the space (designed by Lebel & Bouliane) to once again provide feedback, take in talks and participate in workshops; this time, they were also able to see and interact with physical prototypes of buildings, technologies and infrastructure." A very thoughtful profile of Lebel & Bouliane from Sidewalk Labs' Editorial Manger Vanessa Quirk. "Projects at this nexus of past and future have become a calling for Lebel & Bouliane, the Toronto-based firm Bouliane launched with partner Natasha Lebel in 2010. The firm has created a new headquarters for Cossette Media from a former World War II ammunition factory in Liberty Village; modernized York University’s Student Centre while preserving the glory of its 1991 design; and transformed a crammed corner inside of Philip Johnson’s CBC building into a spacious, light-filled contemporary workplace. Their latest adaptive reuse project will turn a former fish processing plant into “307,” an office space and innovation workshop for Sidewalk Toronto’s explorations-in-progress. That hyper-sensitivity to “intrusion” is critical to understanding Lebel & Bouliane’s approach. Each adaptive reuse project begins with the architects stripping the building of its more recent renovations or additions to reveal and express the original structure — and hence the building’s history. Only then do they begin to weave in their own architectural interventions, which often take the form of dramatic geometric volumes, warm natural materials, and site-responsive forms. Lebel & Bouliane was featured in a Blog TO article about the Sidewalk Labs Quayside development and the new Sidewalk Toronto HQ (designed by Lebel & Bouliane). Sidewalk Labs will be hosting its next Public Round Table Meeting on May 3rd, 2018, we encourage everyone to go and be part of the conversation around this exciting new opportunity for Toronto! "There was also talk about Google leasing a waterfront office to showcase some of said technologies, but now we are learning more about where that office will be (near Lake Shore and Parliament) and how it could function. "Sidewalk Toronto will open an office on Quayside this summer, at 307 Lake Shore Boulevard East," reads the summary report. "The office will double as a living laboratory for many of our innovation concepts and will be open to public visitors." This is the site of Sidewalk Toronto's new base for project development prior to any renovations. Toronto-based architecture firm Lebel & Bouliane Inc. has been selected to design the new Sidewalk Labs Toronto HQ, which it says will house offices and public engagements starting this summer. Previous to this, the space was occupied by some Maple Leaf Sports & Entertainment properties, including NBA TV Canada. It's all part of Sidewalk Toronto's "core planning work," which includes pilot ideas and prototypes like the recently-launched Old Toronto historical photo mapping tool and others that "remain in development." Lebel & Bouliane is excited to announce that we will be designing STACK's new offices in Toronto's Distillery District. "STACK is a fee-free mobile app for personal money management [...] STACK provides a simple way for our members to understand and improve their financial health, creating a positive, sustainable relationship with their money, without the stress associated with most financial products or transactions". Project coming soon! At a public round-table meeting on March 20th, 2018, it was announced that Lebel & Bouliane was selected to design Sidewalk Labs' new Toronto HQ at 307 Lakeshore Blvd East. Opening Summer 2018, the space will house Sidewalk Labs local offices, as well as host public engagement events for the future Quayside development. Lebel & Bouliane is featured in this month's Interior Design Magazine for our design of Bensimon Byrne and One Method Toronto Offices. Wish us luck as a finalist for this year's Best of Year - Mid-sized Creative Office in Interior Design Magazine, for the design of Bensimon Byrne and One Method's new offices. Winners to be announced Dec 1. 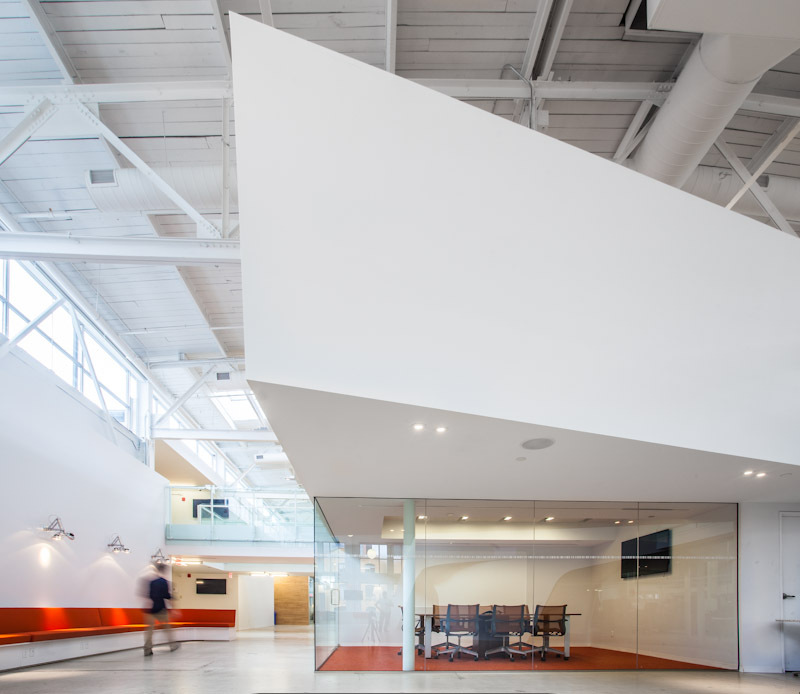 We transformed the offices of Canada's largest independent ad agency for a new world of work. Check out the full feature on the spaces for Bensimon Byrne and One Method in this month's issue of Canadian Architect. Construction is well underway at the CBC Building as Bensimon Byrne's new space begins to take shape! Check out the huge hole we cut in the floor to make way for the new feature stair. Leading up to the second floor from the main reception area, the stair will ease circulation between the two levels, and make a bold statement as clients walk in. More renderings of the stair, and the rest of the 50,000 sq ft project, can be found in our portfolio, here. The construction for One Method's new digs is underway this week at Wellington and John streets. 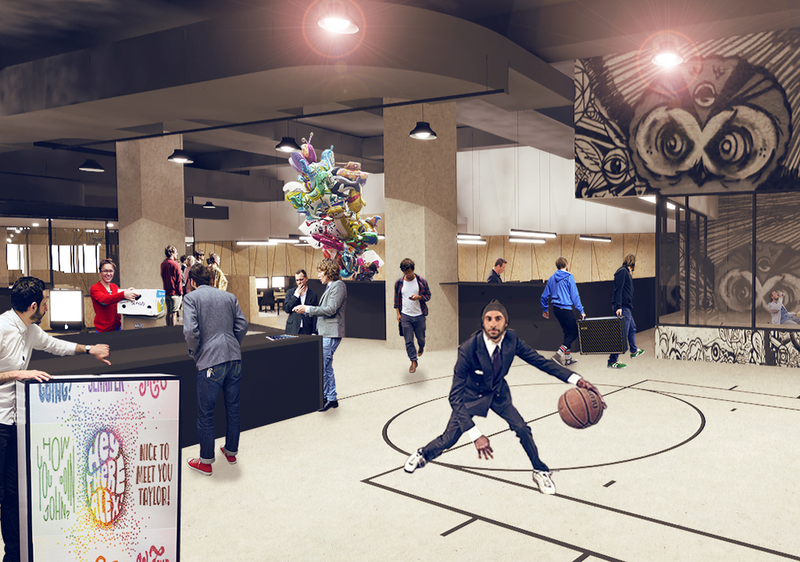 Occupying a 15,000 square foot raw space, previously used by the CBC for staging and warehousing, the One Method team will have lots of room to work and play. Construction slated for completion in fall 2016. Check out our new photos of the Camp Jefferson creative agency in Liberty Village. Cool space on a budget. Thanks to everyone for such a great shoot! View the full project here. Construction starts in Toronto's famed CBC building this week, to make room for Bensimon Byrne's dynamic creative team. A sneak peek above of the their central space – nicknamed the Agora – and the 28 foot volumes that punch through the space where recording studios once filled the space. No small feat, this conversion of Philip Johnson's purpose-built concrete matrix will house over 250 people across various divisions of Bensimon Byrne. See more renderings here. CAMP JEFFERSON CREATIVE AGENCY | NOW OPEN! Toronto's newest boutique creative agency — Camp Jefferson — opens in Toronto with a raw and dynamic space in the heart of Liberty Project. See the project here. Phil Roberts discusses business and architecture with Luc Bouliane on Sixty7 Architecture Road, a Canadian blog on Architecture and Design. The article explores the business side of design – from the clients’ perspective – and features Cossette and York University Student Centre and FoodCourt. Creative agency Cossette at Liberty Village been selected as one of Canadian Interior’s 16th Annual Best of Canada Design Competition in the office category, and is also published in the September / October issue. See the project here.